One thing that has caught my attention recently has been people’s ability to utilize Instagram to grow their business. At first, I thought this was all about just creating another “touch-point” for one’s audience, to be able to show them something behind the scenes to deepen and strengthen that relationship you have with them. But later, I found out that Instagram could be used in a very tactical way with real numbers, and real results. I reached out to a number of people to ask them how they actually used Instagram to grow their business. Jen and Jadah from SimpleGreenSmoothies.com (who you’ll hear from in March in Session 205 of the SPI Podcast) use it very well, and we’ve already heard Susan Petersen from FreshlyPicked.com (Session 165) share about her success on Instagram too. When I was trying to figure out “the formula,” I remembered the interview I did with Nathan Chan in Session 169, where he talked about building a six-figure digital magazine, and I reached out to him for advice because Instagram is a huge part of his overall marketing strategy. After telling him I wanted to find the formula for Instagram, he directed me to an article on his site, Foundr.com, that he had already written on the topic, which was perfect. He even offered to let me re-post it here on the blog, which is what I’ve done for you below. I don’t normally do this, and usually I’d re-write the topic in my own voice using my own examples, but the post is so good, I wouldn’t be able to do justice to the strategy myself. 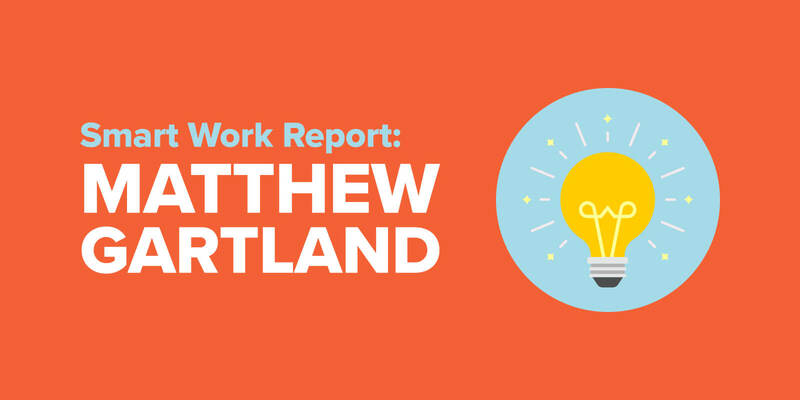 So here it is, from Foundr.com (and written by Jonathan Chan). If you run an online business, these days, you live or die by your mailing list. But growing that email list is easier said than done. It can take a couple of years before you even hit 10,000 email subscribers. 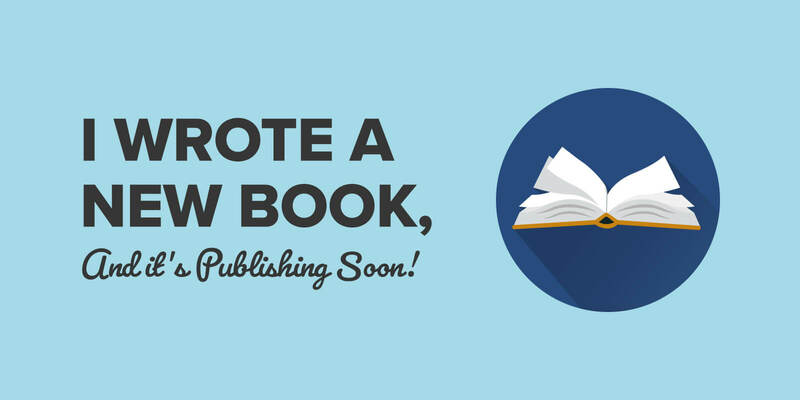 Foundr has a mailing list of, at the time of this writing, more than 100,000 subscribers. It took us just over one year to reach this milestone, and Instagram was a large part of our success. We took advantage of all the opportunities offered by Instagram, building our Instagram followers from 0 to 400,000 in just 11 months, and converting 30,000 opt ins in just 30 days. In the following post, I’m going to reveal to you (some of) our secrets to using this powerful social media platform and how to create your own Instagram sales funnel. And even if you’re not looking to build an email list, read on, as much of this will be useful to anyone looking to make an impact with Instagram. So I’m going to throw some stats at you. You ready? Today Instagram is one of the leading social media platforms in the world, with more than 400 million active users. In the United States alone, there are 64 million active users, a figure that is projected to hit 111 million by 2019. It is the preferred social media network for teens in the United States, surpassing both Facebook and Twitter, and globally the majority demographic of Instagram is millennials, with a 42% penetration rate. According to comScore’s 2015 mobile trends report, millennials spend upwards of 420 minutes a month on Instagram alone. Another report by Forrester Research found Instagram users were 58 times more likely to like, comment, or share a brand’s post than Facebook users, and 120 times more likely than Twitter users. So long story short: Instagram is the best social and mobile platform for brands to reach out to audiences who are willing to engage. If you’re not on Instagram then you should be. Here’s what you need to do if you want to start crushing it on Instagram. If you want to start converting massive amounts of people using Instagram into paid customers & subscribers, you need to start building a funnel. I don’t mean a literal funnel, although feel free to make one if you wish, it’s a pretty nifty kitchen appliance. What I’m talking about is an online sales funnel. 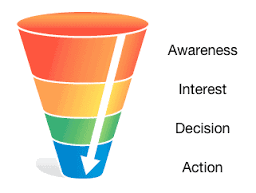 Now the idea behind a sales funnel is pretty simple, in fact the majority of marketing can be categorized into the AIDA model. Your job is to drive people through your funnel and guide them to your preferred end action. In this case, subscribing to your email list. This one is kind of obvious, seeing as how Instagram is a content platform, and without great content you won’t be converting anyone anytime soon. But how do you create content that converts? How do you get their attention and interest? Well first off, they key to the Instagram sales funnel is to make sure that you’re offering both great design and value. They say a picture is worth a thousand words, so make sure you’re saying the right ones. One of the reasons we use quote images at Foundr is because they provide immediate value. Anyone can look at these images and immediately find value in it, plus it’s the kind of content our audience likes. Great design will grab people’s attention but the value you provide will make them interested. If you’re not providing value in your posts, people will just scroll on past. Also notice the designs we use—not flashy or ostentatious, but definitely eye-catching. At Foundr we like to use apps like WordSwag and Typorama to create our pictures. No need for expensive designers. But you don’t have to take the route of motivational quotes. Find out what kind of content your audience likes. One example is Frank Body’s Instagram account. (Note from Pat: some of the content on this feed may not be appropriate for all ages.) Much of their content is user-generated. This immediately brings value, not only to the person lucky enough to get their photo chosen, but also by making their brand a lot more down-to-earth and human. They understand their audience reacts positively to aspirational images, and you’ll notice that design-wise all of their pictures fall under a consistent theme. 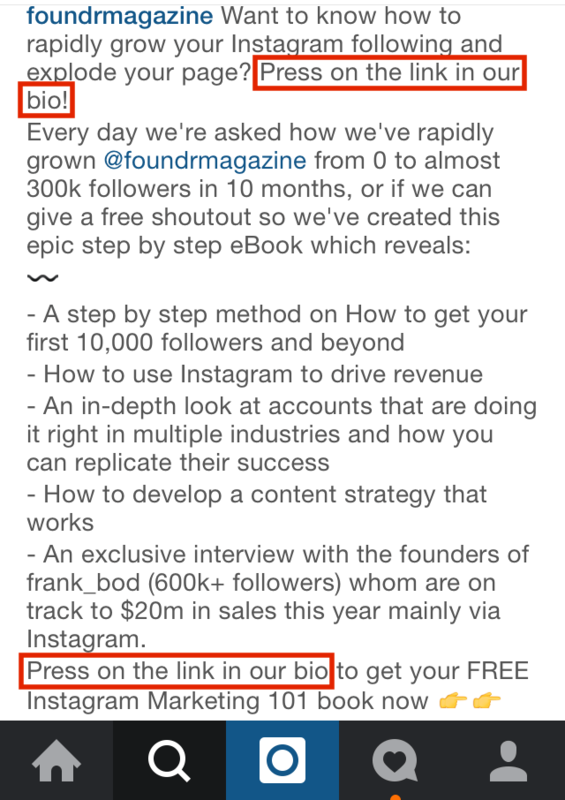 This strategy has worked extremely well—as the Frank Body team told us in a recent interview for the Foundr podcast, they’re on track to hit $20 million in sales in one year, relying heavily on Instagram. I also recommend checking out Buffer’s own list of tools and resources to create images for social media. 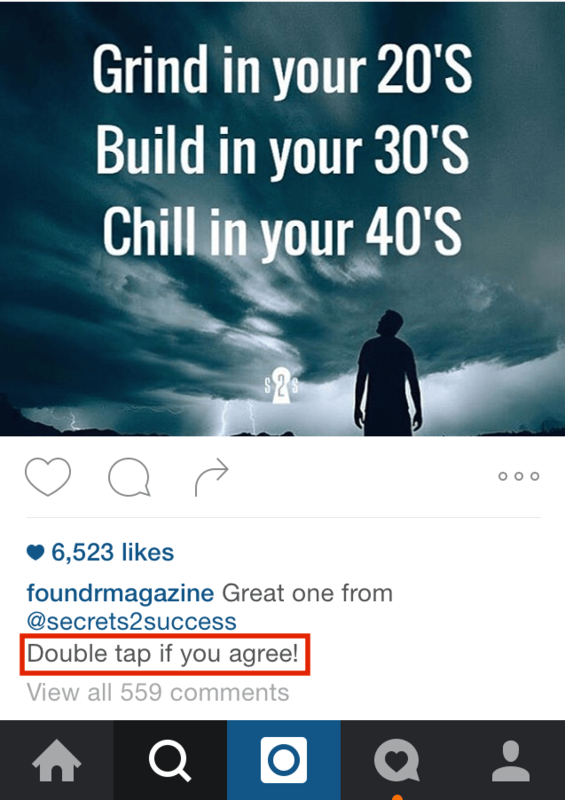 So now that you have your audience’s attention and interest, here’s the next part of the Instagram sales funnel. A lot of people think that all you need to do is create great content for your audience and the work is done. Well for the most part they’re right, if all they’re looking for is to raise awareness of themselves. While a big following is impressive, it ultimately means nothing if you don’t do anything with it. While you can build some kind of call to action right in the image you post, we’ve found that it sends too many mixed messages to our audience. Which is why we take advantage of the caption. The caption is incredibly important because it helps frame your image and give it the necessary context for your audience. With Instagram’s latest update, only the first two or three lines of your caption will be seen. Meaning that you’ll either need to provide context immediately, or create a line that’s so attention grabbing that people can’t help but want to read more. Due to the vertical scrolling nature of Instagram, your audience will have to scroll past your caption before being able to get to the next picture. People will naturally just read or at least scan through your caption, since it’s literally the next thing they see. Take advantage of that, because this is where you get to propose a decision to your audience. Whether it’s asking someone to tag someone else, leave a comment, or like your photo, you’re asking your audience to make a decision. It’s that one line that allows us to generate the amount of engagement that we do. You might remember this classic study by Robert Leventhal in which he analyzed the effects of urgency and information. He handed out two pamphlets on the subject of tetanus. Both were the same, except the second pamphlet included information on where to get vaccinated. Those who got the second pamphlet were 25% more likely to get vaccinated. But the study also found that they were more likely to be engaged with the material and recall specific information compared to the other group. A simple line like “Double tap if you agree!” or “Tag a friend!” is all about presenting options for your audience so they can make a decision. You’re asking them to make a choice, and to act on that choice. Without that invitation, they would just scroll on by. So how do you present a decision that gets them through the rest of the funnel? Your bio link is one of the most important features on Instagram—if you’re not taking advantage of it then you’re not going to be converting your Instagram community into your funnel. On Instagram, you can’t post live links into the captions or comments, meaning the only live link you have is your bio link. This is why you have to make sure that your caption works in tandem with your bio link. So the decision you present is the option to click on your bio link. Now this is the tricky bit. Studies have shown that the more actions your audience has to take, the less likely they’ll follow through. So unlike double-tapping a picture, or tagging a friend, asking someone to click your bio link requires multiple actions. Which is why you have to make it as much of a no-brainer as possible. Really sell the idea; create desire by showcasing how much value your audience would be getting by clicking the link. Here you can see how we use our caption to its full effect in order to drive people toward our bio link. It’s also important to note the effect of the bio link. Rand Fishkin of Moz emphasizes the importance of having a readable URL, as opposed to a series of random characters. The easier it is to understand, the more likely people will click the link. We created a custom URL that’s short and to the point. It’s easy to remember and emphasizes the most important feature to our customer. It’s really easy to create a custom URLs. At Foundr we use tools like bit.ly or PrettyLink. So you’ve successfully driven people to click the link and they’re on your landing page. Now it’s crunch time. It’s the end of your Instagram sales funnel, and this is where you get your audience to complete your desired action. Make no mistake about it, if you don’t have a fantastic landing page you won’t be able to convert. Now there are a lot of elements that go into what makes up a fantastic landing page. But here are our main tips and tricks on building a great landing page for Instagram. First and foremost, we make sure that the landing page is optimized for mobile. The majority of Instagram users are mobile users, so make sure you’re catering to that kind of audience. If the first thing your audience sees is a cluttered web page, and they have to zoom in and search around for the relevant content, all you’ve done is frustrated someone and sent them running. Remember, the more actions your audience has to take, the less likely they’ll follow through. Check out Moz’s best-practices guide on optimizing for mobile. I can’t emphasize enough how important optimizing for mobile users can be when it comes to finding success on Instagram. 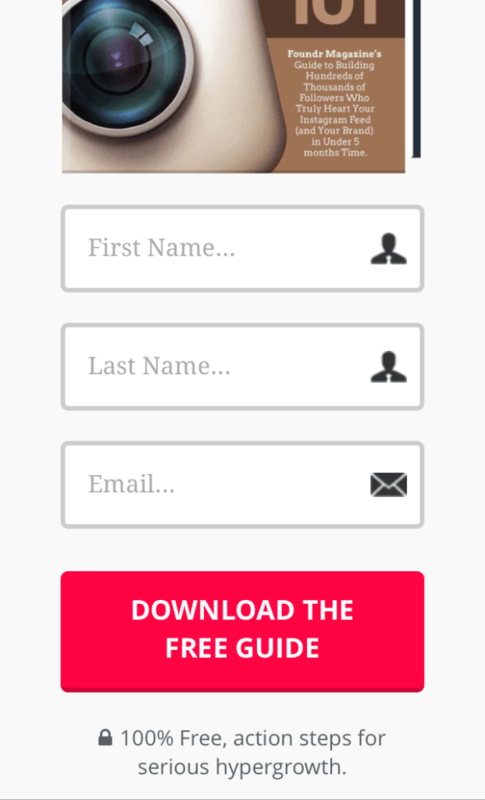 We also make sure to keep our landing page minimal in design. On this matter, we take our cues from Unbounce. If your landing page is too busy, the message can become conflicting, and people will leave. Keep it as simple as possible. Also, your headline should be clear and outcome driven. Here’s the first thing people see when they click on our bio link. Our headline immediately tells our audience what we’re offering and exactly what they can expect. In our case, it’s a free eBook on how to dominate Instagram. In order to achieve the ROI that we do, we make sure that we’re offering something truly valuable. Something that we know our audience would love. A complete no-brainer. It was easy to deduce that people on Instagram would appreciate a gift about Instagram, which is why we offer a 58-page eBook outlining all our basic strategies, tips and advice. But in order to access it you first have to provide your name and email address. And that’s how we do it. 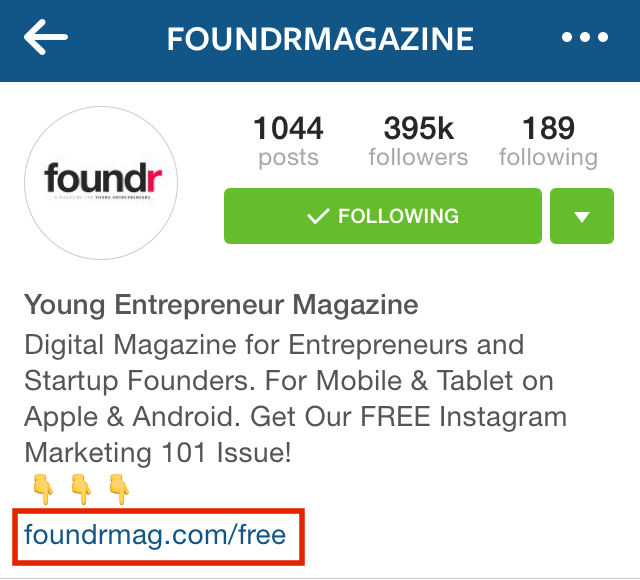 Those are the basics of Foundr’s Instagram funnel. This is why our landing page has a higher than 70% conversion rate and we’ve reached more than a hundred thousand email subscribers. We offer so much value that it’s an absolute no-brainer for someone to sign up. Now you have a solid funnel in place, so you should be all good to go right? Wrong. Any marketer worth their salt will tell you the same: It’s never set and forget. Here’s the thing most people forget when it comes to social media marketing—social comes first. If you’re not taking advantage of the networking opportunities, you’re not even scratching the surface of social media marketing. So here’s how you can bolster your funnel, and your rate of conversion, by being part of the Instagram community. Instagram is home to an incredibly vibrant community of entrepreneurs and startups. Like any other space, you’ll easily be able to find who these influencers are, as they usually have the biggest voices. But don’t just look at how many followers they have, also take note of how much engagement they have. The follower count, while important, doesn’t really matter as much as their level of engagement. Are they getting lots of likes? How many comments? These are all factors you need to pay attention to when deciding on which influencers to contact. To get ahead with Instagram, you need to be able to get on the radar of these influencers. But to get on their radar you have to do more than just like a couple of their pictures. The easiest way to do so is to leave a thoughtful comment. Move past the generic “Amazing!” and “Wow! Nice post!” comments, because that’s what they are, generic. Actually ask a question, start a conversation, say something that separates you from the crowd. It’s astounding how rare it is to see comments that are authentic and genuine. Comments like that provide value, and that’s exactly what you want to be doing. Providing value is the surefire way to get noticed. Another way to provide value is to shout them out with one of your posts. You can do it in your caption, or in the image, even reuse of their images if you have their permission. Be creative in finding ways to provide value. Here’s the currency that drives the Instagram economy: Share for Share. This, by far, is the best way to introduce your brand to a whole new audience. Getting shouted out by a major influencer will do more for your Instagram account than a week’s worth of consistent posting. When it comes to reaching out to influencers, most Instagram users have a Kik, a mobile messaging service that allows you to contact them. Otherwise you could always settle for Instagram’s direct messaging feature. But in order to get a shoutout, you have to provide a mutual exchange of value. Now the most straightforward way to do that is in the name, they share a post of yours and you share a post of theirs. Pretty simple stuff. However, when it comes to approaching a larger account, it gets a bit tricky. Obviously you don’t have the same number of followers as they do, so how do you provide value for a larger account? You can always work out a ratio deal, where you provide three shoutouts to their one. Sometimes, even though they have a higher follower count, your followers may have a comparable or higher level of engagement. Use that to your advantage—offer to help them with their engagement by tagging friends of yours onto their pictures, or provide valuable comments and contribute to the conversation. Again, it’s all about providing value, and then leveraging that value. Of course you could always pay for a shoutout, but be wary of whether it’s worth it. At Foundr we pay anywhere between $100 to $250 depending on the account size, but rates can always be negotiated. To ensure that you get your money’s worth, make sure that the influencer has a lot of engagement and their audience is the kind you want. Just in case the above wasn’t enough, here’s a couple of extra tips in order to get more people through your funnel. Jab, Jab, Jab, Right Hook! You’ll find that we closely follow this strategy and it’s proven to give us great results. As you can see, we only do a promotional image one out of every 10 or so images. It’s not that we don’t want to drive more people through the funnel, but we understand that it’s more about giving than it is getting. One thing you have to keep in mind is that people hate being advertised to. If you’re constantly bombarding people with content that has no value, and is solely to promote yourself, you’ll quickly lose followers and develop a bad reputation. Just keep in mind that you should always be providing value to your audience. The thunderclap is an incredibly powerful strategy where you promote your brand, or product, through a synchronized social media blast. The key to this strategy is to have multiple influencers, not just you, agree on a certain time when you’ll all promote your product simultaneously. This exposes your brand and your message to as many different people as possible. But to do it, you’re going to need the help of a solid network. 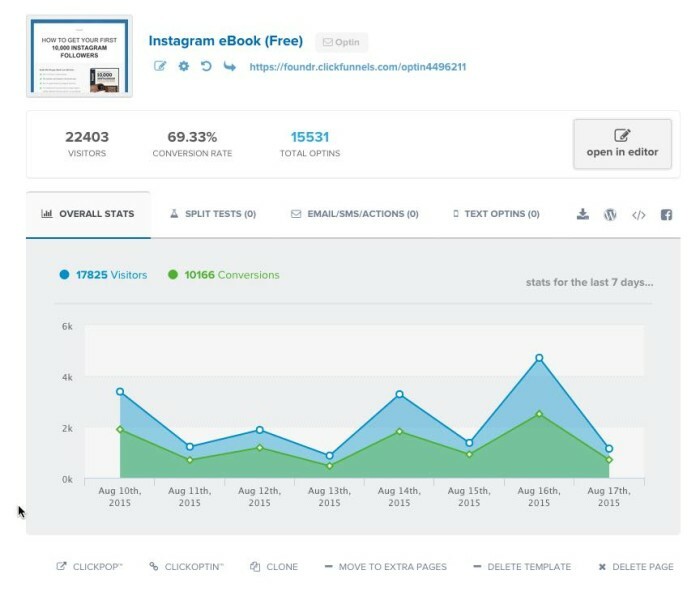 This is when the hard work of connecting with influencers starts paying dividends, because you’ll be able to start scheduling posts by other influencer accounts and start building your thunderclap. 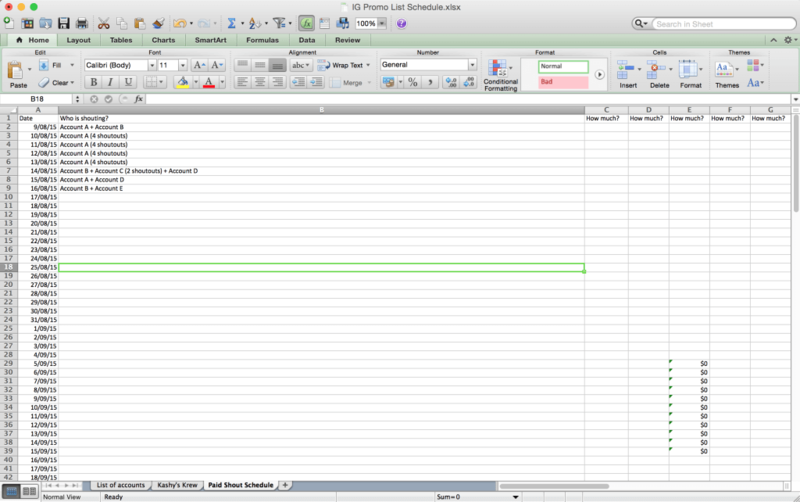 Here’s a basic template of how we schedule our thunderclap strategy with a simple Excel doc. So there you have it—a crash course on how to use Instagram to build a huge email list. And like I pointed out earlier, these tactics are valuable for more than building up email subscribers. Instagram holds tremendous potential for just drawing attention or making any number of other calls to action. Just remember the take-home points—always be providing value, and make things super-simple for your audience. 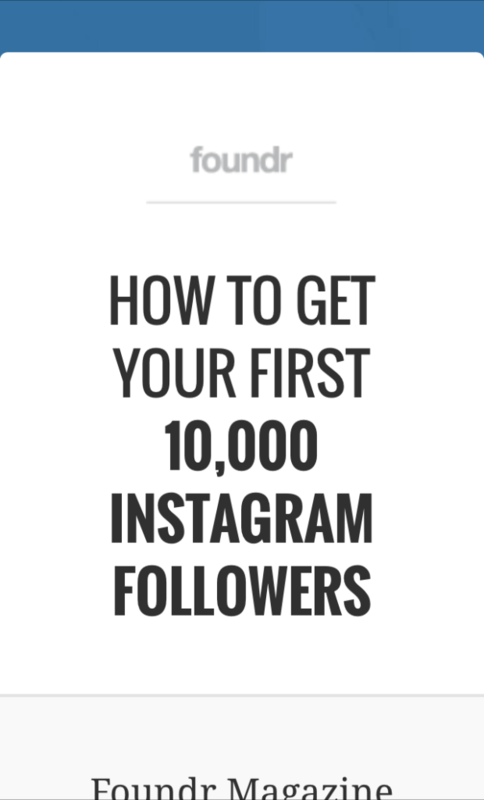 If you’ve found this information useful and you would like an even more in-depth actionable guide, we highly recommend you download our FREE Instagram Ebook on How to Get Your First 10k Followers. Thanks again Nathan for allowing us to share this here on SPI. 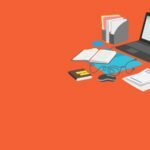 It’s a great piece, and full of a ton of actionable advice! 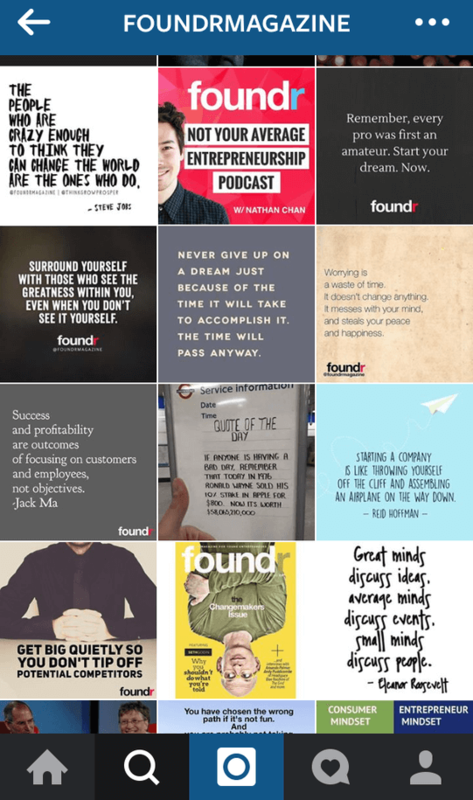 Make sure to follow Foundr on Instagram, and my account, Pat Flynn, as well!